A short history of a strike by coal miners organised in the syndicalist One Big Union in Alberta which was repressed by bosses and the state. During the summer of 1919, terror visited the Drumheller coal mining region of Alberta. Under the banner of the One Big Union (OBU), about 6,500 miners in the province walked off the job during a dispute over wages, the cost of living allowance, and working and living conditions. Although conflict between miners and operators increased throughout the province, the strike passed without much violence in most coal districts—except in the Drumheller mining region along the Red Deer River Valley. Tension percolated throughout the valley as the owner of the Rossdale Coal Mine hired returning First World War soldiers to keep his mine operating during the strike. To ward off a possible interruption by striking miners, the Royal Northwest Mounted Police and the Alberta Provincial Police were called in to protect the mine. Their interest, however, appeared to be on keeping the peace at the mine operation itself, rather than on maintaining order elsewhere throughout the valley. Thirteen mining companies in the valley were given permission to hire war veterans as “special constables” to persuade the strikers to return to work. These strike busters were paid ten dollars a day and offered free alcohol to end the OBU strike. The Mounties and the Alberta Provincial Police officers gave a blind eye to the activities of the strike busters in the valley of the Red Deer River. 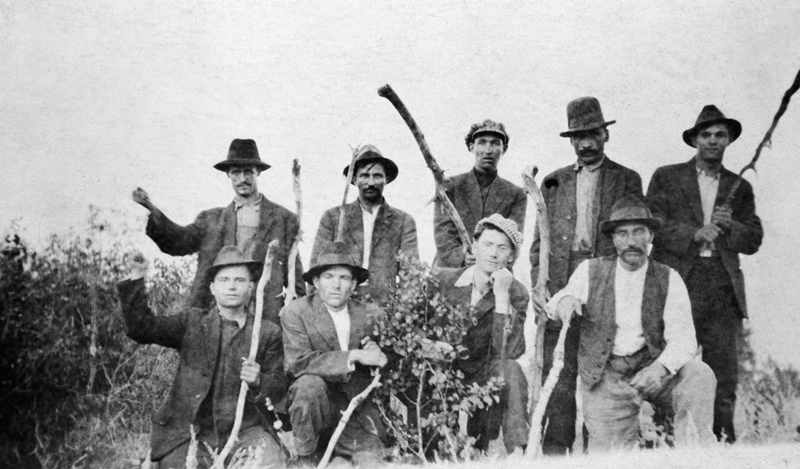 Although accounts somewhat vary, historians assert that groups of strike busters—who were issued pick handles, crow bars and brass knuckles—began “patrolling” the streets and intimidating the miners and the OBU leaders. Tactics included hanging striking miners upside down by their feet as well as taking miners out of town, where they were beaten and left to suffer. On August 9, 1919, John Sullivan, a leader of the OBU in Drumheller, was attacked in his own bed by five men who wanted him out of town. The OBU leader narrowly escaped with help from a rifle-toting neighbour. Two days later, another squad of strike busters arrived in Drumheller where they rushed the strikers’ homes. Miners who took to the hills were hunted down and beaten. Newspapers of the day overlooked the violence that occurred in the valley, since they tended to be owned and organized by the upper middle class peers of the mine operators. Although the region simmered with terror that summer, the provincial police’s annual 1919 report offered only a brief summary: “On the nights of August 11th and 12th, the citizens and returned soldiers’ organizations expelled the agitators of the OBU from the valley and a few days later all the mines in the district were working again.” The sole arrest was of a striking coal miner who was charged with illegal possession of a firearm and labeled an enemy alien.